The Upper Leas gardens at the top of the cliffs at Folkestone, and the Lower Leas gardens along the foot of the cliffs, were created by Lord Radnor in the late 19th century in order to attract Victorian holidaymakers to the town. He also built a water-balance lift in 1885 to transport promenaders nearly 50m from top to bottom – and vice versa. This did not cater for people in bath chairs, however, so the Folkestone Council decided to construct a new path – known as the Zigzag Path – up (or down) the face of the cliff. Following the successful construction of Pulhamite features in Ramsgate and other seaside towns over the previous few years, the contract was awarded to James Pulham and Son. My grandfather, Fred Hitching, was Foreman, and I have since learned that his brother, John Hitching, worked with him – perhaps as Joint Foreman. Another Pulham ‘Rock Builder’ who worked on this project was Fred Rickett, about whom much more is written in Chapter 44. Work began in June 1920, and it opened in June 1921. The path is in five sections, and covers a substantial vertical area of about 75 metres across and 50 metres high. 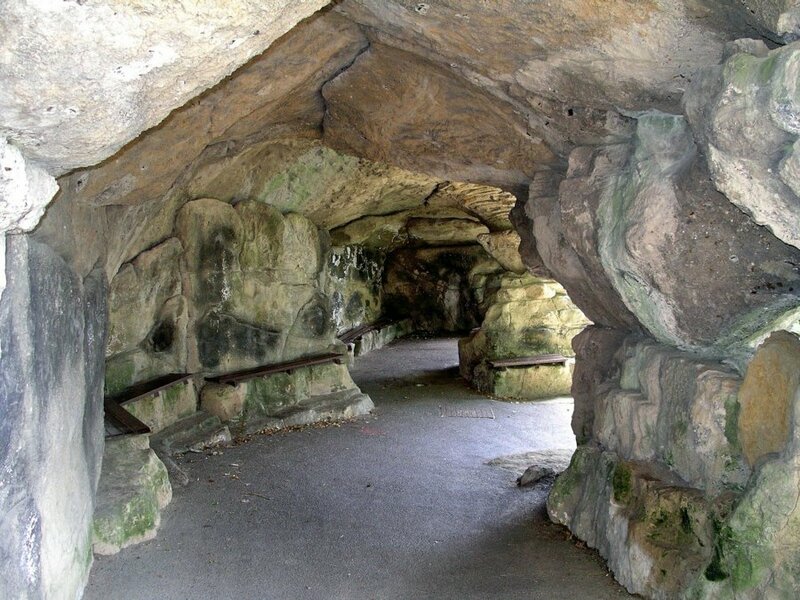 It incorporates steps, seats, plant pockets, low walls, and with tunnels, arches and caves at each turn. It is still in remarkably good condition, although some of the Pulhamite facing to the top sections of the path have by now been badly affected by the erosion of the sea air. Look carefully, and one can even find one or two ‘Pulham faces’ inscribed into the facing of the ‘rocks’. A full description of the work done by James Pulham and Son at Folkestone – together with a number of pictures – can be found in Chapter 40 of Rock Landscapes: The Pulham Legacy – the critically-acclaimed and lavishly illustrated definitive story of the lives and work of James Pulham and Son. Written by Claude Hitching, with featured photography by Jenny Lilly. Published by Garden Art Press. Posted on October 13, 2014 June 30, 2016 by Claude HitchingPosted in Book ContentsTagged . . James Pulham and Son, Claude Hitching, Folkestone Council, Fred Hitching, fred rickett, john hitching, Lord Radnor, pulham faces, Rock Landscapes, tunnel, Zigzag Path - 'The Leas' - Folkestone.